Amidst increasing digital payments push and awareness amongst consumers, FreeCharge has announced that it is witnessing a major chunk of its transactions coming through online partners. Nearly 20% of the wallet transactions happening on the platform are on either one of the online merchant partners. This is closely followed by offline partnerships wherein Fuel and Food are the top 2 categories driving adoption and transaction. In the offline space, fuel refilling and dine-out or food orders are driving growth for the firm. On a percentage basis, Fuel right now comprises 39% of the daily offline merchant transactions while the same figure for the food category stands at 29%. This is basis the fact that both these categories drive high repeat usage on the part of the customer and builds the digital transaction habit for the consumers. FreeCharge had recently announced its plan of on-boarding 1 million merchants in the next 12 months already has a lot of online partners and will increasingly focus on offline space to meet the target. The company has already on boarded nearly 18,000 petrol pumps in the top 20 cities for example and plans to cover petrol pumps associated with HPCL, IOCL and BPCL pan India in a period of 2 months. 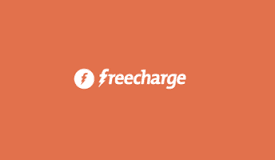 With an increasing focus on the less cash economy, FreeCharge is increasingly focusing on both online and offline partnerships to enhance its digital footprint in the payment space. Few of the prominent online merchants for the wallet firm include irctc, foodpanda, swiggy, bookymyshow, redbus, zomato amongst many others. In the offline space the prominent partners include McDonalds (West and South), Pantaloons, Shoppers Stop, Café Coffee day, Barista, Heritage Fresh and many others.